Lent Hymn: Open, O Hard and Sinful Heart! "It is accomplished; and bowing his head he gave up his spirit." Today the whole Church mourns the death of our Savior. This is traditionally a day of sadness, spent in fasting and prayer. The title for this day varies in different parts of the world: "Holy Friday" for Latin nations, Slavs and Hungarians call it "Great Friday," in Germany it is "Friday of Mourning," and in Norway, it is "Long Friday." Some view the term "Good Friday" (used in English and Dutch) as a corruption of the term "God's Friday." This is another obligatory day of fasting and abstinence. In Ireland, they practice the "black fast," which is to consume nothing but black tea and water. According to the Church's ancient tradition, the sacraments are not celebrated on Good Friday nor Holy Saturday. "Celebration of the Lord's Passion," traditionally known as the "Mass of the Presanctified," (although it is not a mass) is usually celebrated around three o'clock in the afternoon, or later, depending on the needs of the parish. The altar is completely bare, with no cloths, candles nor cross. The service is divided into three parts: Liturgy of the Word, Veneration of the Cross and Holy Communion. The priest and deacons wear red or black vestments. The liturgy starts with the priests and deacons going to the altar in silence and prostrating themselves for a few moments in silent prayer, then an introductory prayer is prayed. In part one, the Liturgy of the Word, we hear the most famous of the Suffering Servant passages from Isaiah (52:13-53:12), a pre-figurement of Christ on Good Friday. Psalm 30 is the Responsorial Psalm "Father, I put my life in your hands." The Second Reading, or Epistle, is from the letter to the Hebrews, 4:14-16; 5:7-9. The Gospel Reading is the Passion of St. John. For more information about these intercessions please see Prayers for the Prisoners from the Catholic Culture Library. Part two is the Veneration of the Cross. A cross, either veiled or unveiled, is processed through the Church, and then venerated by the congregation. 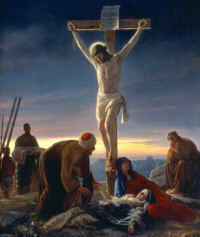 We joyfully venerate and kiss the wooden cross "on which hung the Savior of the world." During this time the "Reproaches" are usually sung or recited. Part three, Holy Communion, concludes the Celebration of the Lord's Passion. The altar is covered with a cloth and the ciboriums containing the Blessed Sacrament are brought to the altar from the place of reposition. The Our Father and the Ecce Agnus Dei ("This is the Lamb of God") are recited. The congregation receives Holy Communion, there is a "Prayer After Communion," and then a "Prayer Over the People," and everyone departs in silence. This is a day of mourning. We should try to take time off from work and school to participate in the devotions and liturgy of the day as much as possible. In addition, we should refrain from extraneous conversation. Some families leave the curtains drawn, and maintain silence during the 3 hours (noon — 3p.m. ), and keep from loud conversation or activities throughout the remainder of the day. We should also restrict ourselves from any TV, music or computer—these are all types of technology that can distract us from the spirit of the day. If some members of the family cannot attend all the services, a little home altar can be set up, by draping a black or purple cloth over a small table or dresser and placing a crucifix and candles on it. The family then can gather during the three hours, praying different devotions like the rosary, Stations of the Cross, the Divine Mercy devotions, and meditative reading and prayers on the passion of Christ. Although throughout Lent we have tried to mortify ourselves, it is appropriate to try some practicing extra mortifications today. These can be very simple, such as eating less at the small meals of fasting, or eating standing up. Some people just eat bread and soup, or just bread and water while standing at the table. For a more complete understanding of what Our Lord suffered read this article On the Physical Death of Jesus Christ (JAMA article) taken from The Journal of the American Medical Association. The Station today is at the church of the Holy Cross in Jerusalem which contains parts of the true Cross and one of the nails of the Crucifixion. The Church commemorates the redemption of the world with the reading of the Passion, the Collects in which the Church prays with confidence for the salvation of all men, the veneration of the Cross and the reception of Our Lord reserved in the Blessed Sacrament.